Today I'm over my sister's house watching my niece (and daughter but then again I always watch her!) 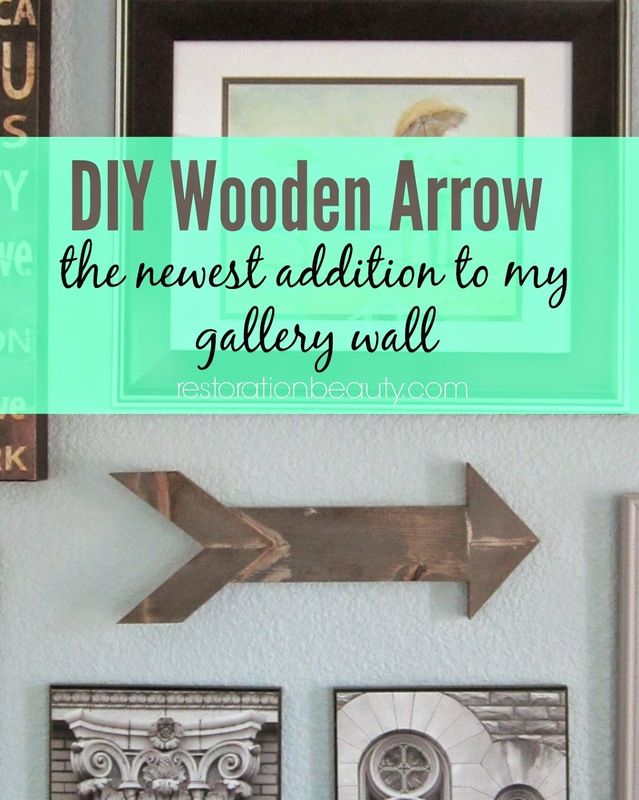 so I thought I'd write a quick post sharing my newest gallery wall love: this DIY Wooden Arrow that adds a little more interest and charm to my gallery wall. 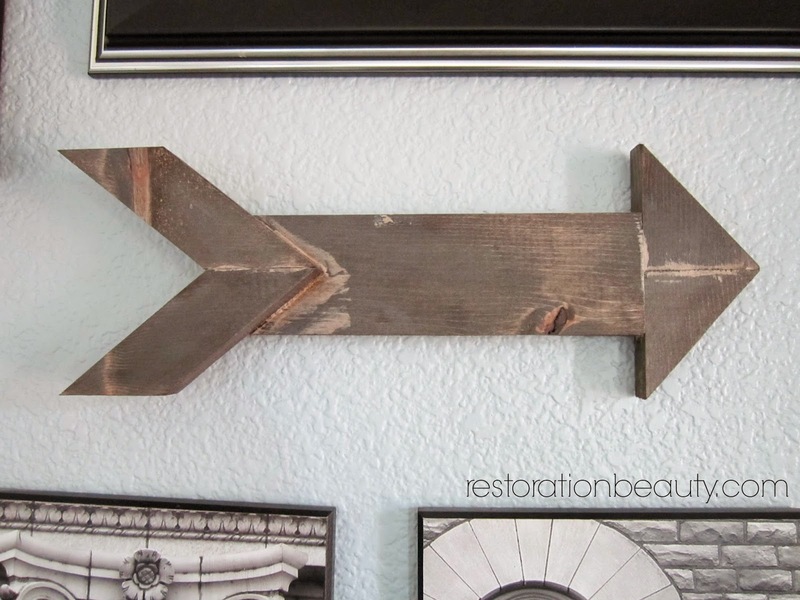 I have an OBSESSION with arrows (there will be quite a few of them in the nursery) and this was the perfect way to incorporate one into our living room! 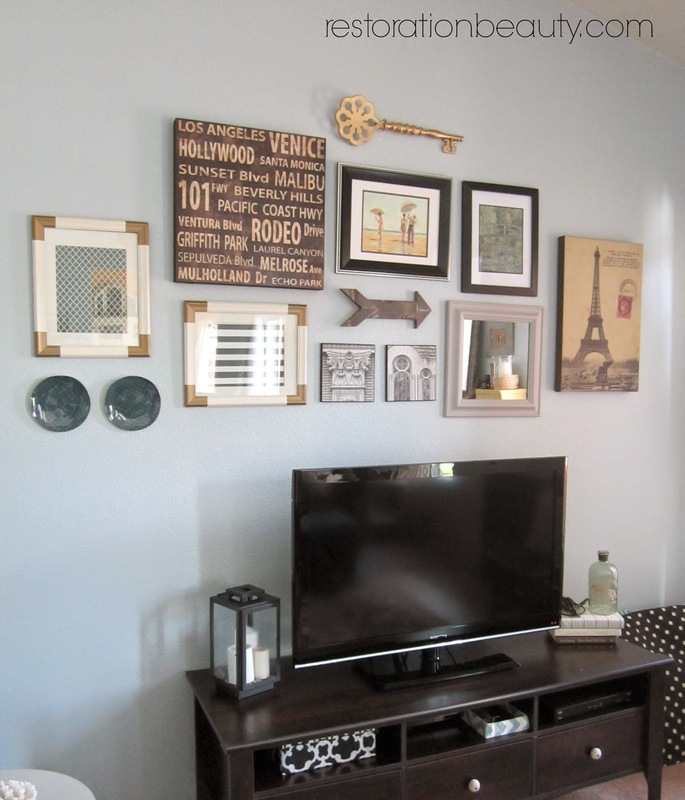 When I first added this gallery wall to my living room, it only consisted of framed pieces. And although I loved it and was so happy I finally had a gallery wall, I knew that at some point I would be adding some interesting pieces with different shapes than a rectangle or square. In other words, I just didn't want frames for a gallery wall. I love when there's a few interesting pieces to break up the frames. 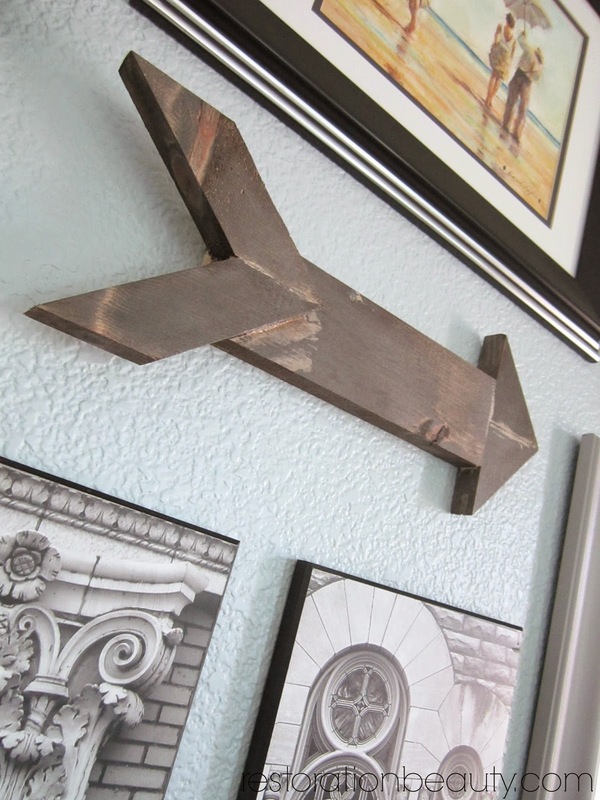 I got my inspiration from this wooden arrow from Liz at Love Grows Wild but instead of using wood pallet, I used left over scrap wood we had from my Rustic Industrial Chalkboard. I don't have a tutorial for you since I made this on a whim (with the help of my awesome husband) one Saturday afternoon. Sometimes I can get a little carried away and forget to take pictures. You can, however, check out Liz's tutorial or this one from Mypinterventures. There's really so many tutorials out there! Just type in DIY wooden arrow on Pinterest and you'll see what I mean. To glue my pieces together I used *Liquid Nails since this is by far the best adhesive I have ever used on a project! I used my favorite gray stain, *Rust-Oleum's Weathered Gray to give it a nice gray wash and then I lightly sanded the whole piece down to distress it a tad. I used my trusty *Command Strips to hang my new arrow and it's holding up great! I love these strips for hanging things on the wall without making ugly holes! I always buy the package that comes with assorted sizes for holding different weights. Genius idea! Isn't it pretty? It's obvious I used too much glue and you can see where the stain didn't take because of the glue...oops. I still love it though! This is what my gallery wall currently looks like and I have a feeling it's not going to stay like this. Nothing in this house ever stays the same for long! I love adding and rearranging things around the house, don't you? Aside from the arrow, my other "interesting pieces" are the small plates and the gold key I got from Hobby Lobby and spray painted gold. Gold just rocks. Gold will always rock. Period. So what do you guys think? Do you love arrows as much as I do? 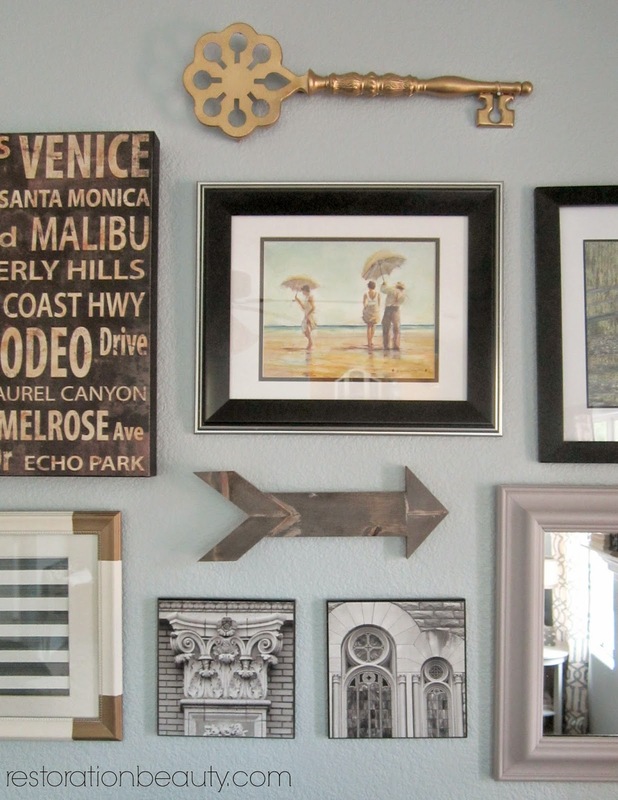 I love the different shapes on your gallery wall! The arrow is the perfect touch and it looks like it was professionally made! And oh yes, gold totally rocks! You're so creative, I always look forward to what you're going to make next! This looks really nice and adds a fun touch to your wall. I don't have a gallery wall but I keep pinning them because I love them. I guess I need to find the perfect spot in my house. Yours looks amazing! Independence Day is the National Day of the United State. Happy 4th of July Flag 2017: Flag of America is not just a piece of cloth but a matter of pride for every citizen of the country where it stands for the pride of the country and wave in the air to represent the nations. Thanksgiving is one the best festival of the united states which is giong to take place this year on 23rd November. Valuable information you have, Keep up the good work you are doing here. I'm just waiting for your next update to come as I like all your posts. Clear Aligner treatment has been taken by millions and the number is further counting. Aligners can help to correct many mal-aligned teeth conditions. You can straighten your crooked teeth, overbite, underbite and gaps between teeth in a very convenient way. The Updates regarding south Zone SSLC School Wise Results 2018 are under consideration. In fact, the region-wise, as well as school wise updates related to it, will be soon get updated at our portal. The release date of official results at the server will be handled by each board separately and the same will be updated throughout SSLC website. Every day feels fresh and kicks start with a great hope and positive attitude. The positive impact once we sent beautiful texts, quotes, as well as morning, wishes to everyone. while what if we sent some beautiful Moms day Images to our lovely mom on May 13th? I think it will be a blessed moment in everyone's life than the other special days. The SSLC Results made an impact pass percentage in Kerala as well the procedure of application for Ekajalakam Application form may have the enormous number of applicants for this year. The HSCAP Portal has been opened for the Ekajalakam registration 2018, be prepared with all new notifications on Plus one Updates 2018.